In the practice of Feng Shui, there are many formulas such as Bagua 8 Aspirations Theory, 8 Mansions and Flying Stars that could help us increase our luck in health, wealth and relationships. However, very often these formulas have to be practiced together with the ancient formula for Chinese Astrology/Zodiac to bring the best out of Feng Shui practice. Chinese zodiacs (horoscope) are based on the lunar calendar and goes in a 12-years cycle giving 12 animals sign altogether according to one's year of birth. 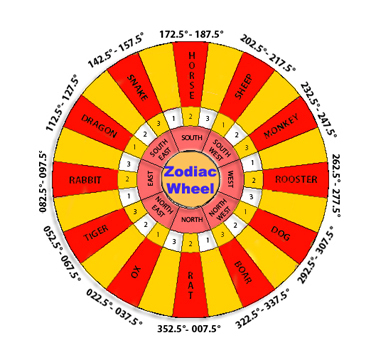 Each zodiac is assigned to one compass direction in a wheel known as the Astrology/Zodiac Wheel. It is this personal compass direction that would benefit one's personal luck in countering obstacles and becoming a winner. When one's personal chi essence in their living space is activated, it will bring the most out of them. 1. Those zodiacs that will be experiencing a good year, your secret friend and allies will help you make the most out of it to achieve maximum results. Carry along jade zodiac buddies lucky charm to help you make the most out of the year to achieve maximum results. They will help you through the challenges, protect against harm and provide great strength for persistency. The secret friend of RAT is the ox. Its allies are dragon and monkey. For RAT people, place this good luck charm in the North to ease your year ahead, remove all obstacles, improve networking and reap the most benefit out of the year for maximum luck. Such zodiac recommendation is presribed by authentic classical feng shui masters. Carry along jade zodiac buddies lucky charm to help you make the most out of the year to achieve maximum results. They will help you through the challenges, protect against harm and provide great strength for persistency. .The secret friend of OX is the rat. Its allies are snake and rooster. For OX people, place this good luck charm in the Northeast to ease your year ahead, remove all obstacles, improve networking and reap the most benefit out of the year for maximum luck. Such zodiac recommendation is presribed by authentic classical feng shui masters. Carry along jade zodiac buddies lucky charm to help you make the most out of the year to achieve maximum results. They will help you through the challenges, protect against harm and provide great strength for persistency. The secret friend of TIGER is the pig. Its allies are horse and dog. For TIGER people, place this good luck charm in the Northeast to ease your year ahead, remove all obstacles, improve networking and reap the most benefit out of the year for maximum luck. Such zodiac recommendation is presribed by authentic classical feng shui masters. Carry along jade zodiac buddies lucky charm to help you make the most out of the year to achieve maximum results. They will help you through the challenges, protect against harm and provide great strength for persistency. The secret friend of RABBIT is the dog. Its allies are sheep and pig. For RABBIT people, place this good luck charm in the east to ease your year ahead, remove all obstacles, improve networking and reap the most benefit out of the year for maximum luck. Such zodiac recommendation is presribed by authentic classical feng shui masters. Carry along jade zodiac buddies lucky charm to help you make the most out of the year to achieve maximum results. They will help you through the challenges, protect against harm and provide great strength for persistency. The secret friend of DRAGON is the rooster. Its allies are monkey and rat. For DRAGON people, place this good luck charm in the southeast to ease your year ahead, remove all obstacles, improve networking and reap the most benefit out of the year for maximum luck. Such zodiac recommendation is presribed by authentic classical feng shui masters. Carry along jade zodiac buddies lucky charm to help you make the most out of the year to achieve maximum results. They will help you through the challenges, protect against harm and provide great strength for persistency. The secret friend of SNAKE is the monkey. Its allies are rooster and ox. For SNAKE people, place this good luck charm in the southeast to ease your year ahead, remove all obstacles, improve networking and reap the most benefit out of the year for maximum luck. Such zodiac recommendation is presribed by authentic classical feng shui masters. Carry along jade zodiac buddies lucky charm to help you make the most out of the year to achieve maximum results. They will help you through the challenges, protect against harm and provide great strength for persistency. The secret friend of HORSE is the sheep. Its allies are dog and tiger. For HORSE people, place this good luck charm in the south to ease your year ahead, remove all obstacles, improve networking and reap the most benefit out of the year for maximum luck. Such zodiac recommendation is presribed by authentic classical feng shui masters. Carry along jade zodiac buddies lucky charm to help you make the most out of the year to achieve maximum results. They will help you through the challenges, protect against harm and provide great strength for persistency. The secret friend of SHEEP is the horse. Its allies are pig and rabbit. For SHEEP people, place this good luck charm in the southwest to ease your year ahead, remove all obstacles, improve networking and reap the most benefit out of the year for maximum luck. Such zodiac recommendation is presribed by authentic classical feng shui masters. Carry along jade zodiac buddies lucky charm to help you make the most out of the year to achieve maximum results. They will help you through the challenges, protect against harm and provide great strength for persistency. The secret friend of MONKEY is the snake. Its allies are rat and dragon. For MONKEY people, place this good luck charm in the southwest to ease your year ahead, remove all obstacles, improve networking and reap the most benefit out of the year for maximum luck. Such zodiac recommendation is presribed by authentic classical feng shui masters. Carry along jade zodiac buddies lucky charm to help you make the most out of the year to achieve maximum results. They will help you through the challenges, protect against harm and provide great strength for persistency. The secret friend of ROOSTER is the dragon. Its allies are ox and snake. For ROOSTER people, place this good luck charm in the west to ease your year ahead, remove all obstacles, improve networking and reap the most benefit out of the year for maximum luck. Such zodiac recommendation is presribed by authentic classical feng shui masters. Carry along jade zodiac buddies lucky charm to help you make the most out of the year to achieve maximum results. They will help you through the challenges, protect against harm and provide great strength for persistency. The secret friend of DOG is the rabbit. Its allies are tiger and horse. For DOG people, place this good luck charm in the northwest to ease your year ahead, remove all obstacles, improve networking and reap the most benefit out of the year for maximum luck. Such zodiac recommendation is presribed by authentic classical feng shui masters. Carry along jade zodiac buddies lucky charm to help you make the most out of the year to achieve maximum results. They will help you through the challenges, protect against harm and provide great strength for persistency. The secret friend of PIG is the tiger. Its allies are rabbit and sheep. For PIG people, place this good luck charm in the northwest to ease your year ahead, remove all obstacles, improve networking and reap the most benefit out of the year for maximum luck. Such zodiac recommendation is presribed by authentic classical feng shui masters.